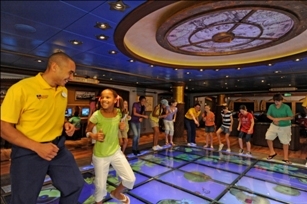 Part of the entertainment department on a cruise ship, the Youth Staff organizes and leads activities for guests aged three to 17. Similar to the position of Cruise Staff, applicants should have related hosting, stage or public speaking experience along with strong microphone skills. Work experience in guest services, child care, resort or recreational camp is also an asset. Some cruise lines expect that potential candidates should have a physical fitness and/or recreational sports instruction background with resorts, sports facilities or related recreational facilities. Other cruise lines specify child care experience as a requirement. A few cruise lines require applicants to have an Associates Degree and/or currently enrolled in an accredited college degree program. Overall, cruise lines are looking for strong, outgoing personalities that are enthusiastic and highly energetic. Candidates must be over 21 years of age. Here are a list of the major cruise lines and details on how to apply as Youth Staff. The Camp Carnival Team is made up of the Youth Director, Club O2 Director (Teens), Circle C Director, Youth Counselors, and Costumed Characters. Carnival Cruise Lines recruits their Youth Staff through their approved network of recruitment partners as well as via their employment entertainment website. Job candidates may apply using an online application form. Additionally, Carnival Cruise Lines’ authorized recruitment partners help screen and interview potential crew members on Carnival’s behalf. Celebrity Cruises lists their current Job Openings on their employment website and qualified candidates are encouraged to apply online. The position of Youth Staff falls under the category of Cruise Activities. Additionally, Celebrity Cruises has a network of hiring partners to assist in meeting recruitment goals around the world. If you don’t see a job posting for a position that matches your qualifications, check with a Celebrity Cruises’ hiring partner. Costa Crociere recruits for the positions of Children Animator and Teen Animator through their Italian employment website. Part of the entertainment department, these positions require previous experience working with children as well as related education. Interested candidates may apply online via Costa’s employment pages. Crystal Cruises hires for the cruise job, Junior Activities Director, through their Los Angeles office. Part of the onboard Entertainment Department, the Junior Activities Director supervises the onboard youth and teen programs for children ages 3 to 17. Crystal Cruises requires candidates to have childcare experience. To apply, submit a cover letter and resume to Crystal Cruises’ Manager of Entertainment. To get hired by Cunard Line as Youth Staff, visit the Carnival UK Careers website for more information. Applicants may view current vacancies and apply online as well as register their personal details with the Carnival UK database for job alerts. The entertainment operations of Disney Cruise Line are led by the Cruise Director and are comprised of more than 50 positions in departments including Adult & Family Programming, Youth Activities, and Port Adventures & Recreation. The Youth Entertainment Host/Hostess may also assist in hosting of adult or family activities. Preferred qualifications include a degree in recreation and a second language. Applicants can apply online through Disney’s job website or contact a Disney “procurement ally” in your region. Candidates desiring employment as Youth Staff with Holland America should visit Holland America’s entertainment job pages. The Club HAL Youth Program has three separate categories including Kids (3-7); Tweens (8-12) and Teens (13-17). Candidates may apply online and upload their resume to Holland America’s employment data base. To apply to Norwegian Cruise Line as a Youth Counselor, visit Norwegian’s employment pages. Norwegian’s website features current shipboard positions available including Seasonal Youth Counselor for holiday periods. Applicants may attach their resume in an email along with a cover letter to be considered for a personal or webcam interview. Additionally, Norwegian Cruise Line has recruiting agents throughout the world, where you may submit your resume to the hiring partner in your region. To get hired by P&O Cruises as Youth Staff, visit the Carnival UK Careers website for more information. Applicants may view current vacancies and apply online as well as register their personal details with the Carnival UK database for job alerts. Princess Cruises cooperates with a world-wide network of Recruitment Partners to hire Youth Staff for their onboard entertainment departments. Contact the recruitment agency that is closest to your permanent residence. Regent Seven Seas Cruises operates its Club Mariner Youth Program during summer months and holiday periods. To apply for a cruise ship job as a Youth Counselor, visit the Regent’s employment pages of their website. Select the option “Ship” for a list of job vacancies. Applicants may also use Regent’s global network of hiring partners to apply for shipboard positions. Royal Caribbean lists their current “Job Openings” on their employment website and qualified candidates are encouraged to apply online. Royal Caribbean has a network of hiring partners to assist in meeting recruitment goals around the world. If you don’t see a job posting for a position that matches your qualifications, check with one of Royal Caribbean’s hiring partners in your region. Additionally, you can apply online through RCI’s entertainment website, Royal Caribbean Productions.